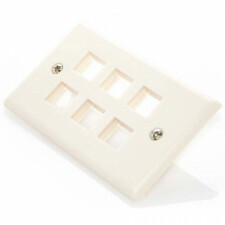 Our keystone wall plates are great for terminating your ethernet, fiber or other connection through a residential or office sheetrock wall. Select the port number requirement and save with our low prices. Choose from a great selection of reliable keystone fixtures to meet any project demand. We offer a great selection of keystone fixtures that work great with our copper and fiber optic keystones.